It’s been a while, I know. We’re going to bypass the life update for now to get on with the good stuff, FOOD (yes, we finally moved into the house in NM and all that). So I’ve seen a few AIP friendly granola recipes out there, but mostly they have just been toasted coconut…. cool, that totally doesn’t count as cereal! So I wanted to find a better way. Done. This granola rocks because it is AIP, can be made more elaborate (and thus not AIP compliant) by adding in nuts and seeds, and it is also sugar free! What?! Can you believe it. I’m awesome, I know ;). You can thank me later. When your tummy is happy. Mix all your ingredients up in a bowl. 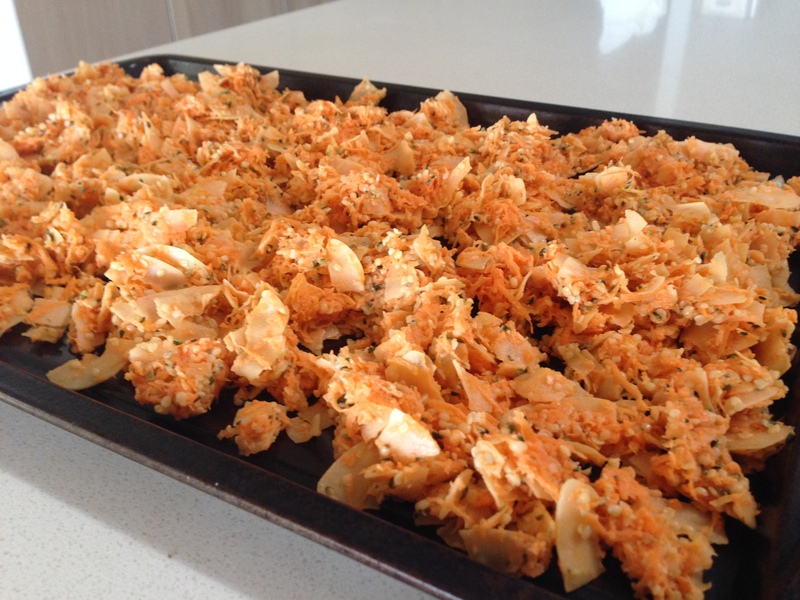 Spread onto a baking sheet and slide into the oven for about 45 minutes or until coconut is golden brown and desired “crunchiness” is reached, stirring halfway through. I prefer to store my granola in the freezer because it lasts longer and maintains the crunchiness better but you can store it in an airtight container for up to 5 days. Yay! You’re back! Just looking at the pictures makes me very, very hungry! Yeah i gave up on AIP cuz nuts snd seeds are too good :). I know they bug me but AIP was just too hard and i didnt need the extra stress right now. I just made this today. I used leftover tiger nut meal from making tiger nut milk instead of the coconut, and used dried white mulberries for the dried fruit. It is sooo yummy. I would never have thought of using sweet potato. Thanks for sharing a great recipe! So glad you enjoyed the recipe! YUM mulberries, I need to do that!! I still haven’t gotten my hands on any tiger nut flour but it seems to be taking the paleo community by storm. Can’t wait to test out your modifications- sounds delicious. Granola can always be temperamental, so best to keep your eye on it. Good tip! 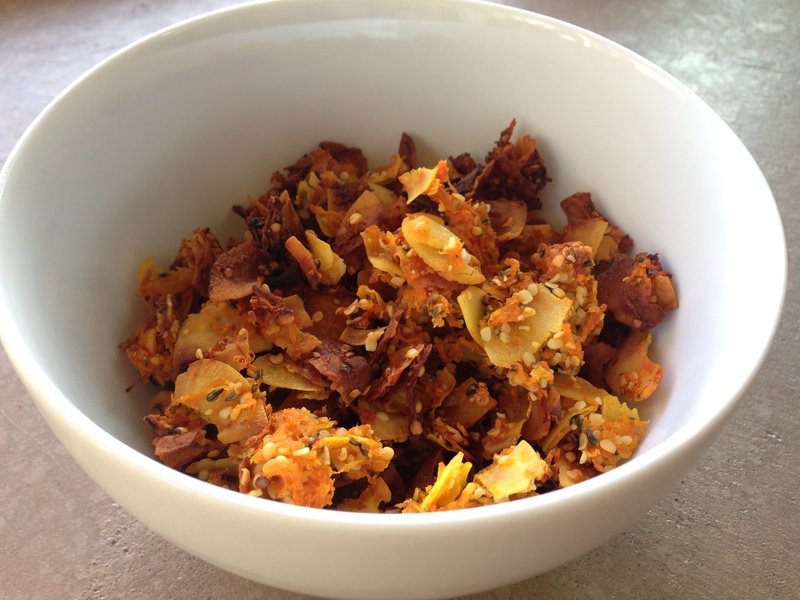 This is a really great AIP “granola” recipe – thank you! In order to make mine shelf stable, I finish it off in my dehydrator at 135F until the remaining moisture is removed (maybe an hour or two). Though it doesn’t last very long at my house because it’s so good, I know I’ve had some in an airtight container on the pantry shelf for 2-3 weeks with no loss in quality. I’ve mixed up the recipe a bit by leaving out the vanilla and switching out the banana for mashed sweet potato with a touch of maple syrup, and I might even like that version better, but both are fabulous! 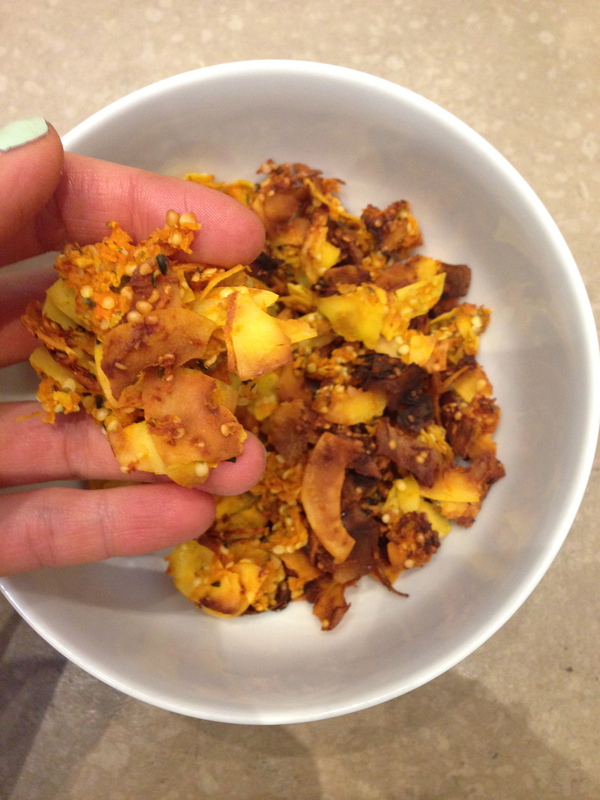 I’m so glad you enjoy this recipe and have found a way to make it your own! I’ll have to give your version a try. I love granola and have been craving a batch recently. 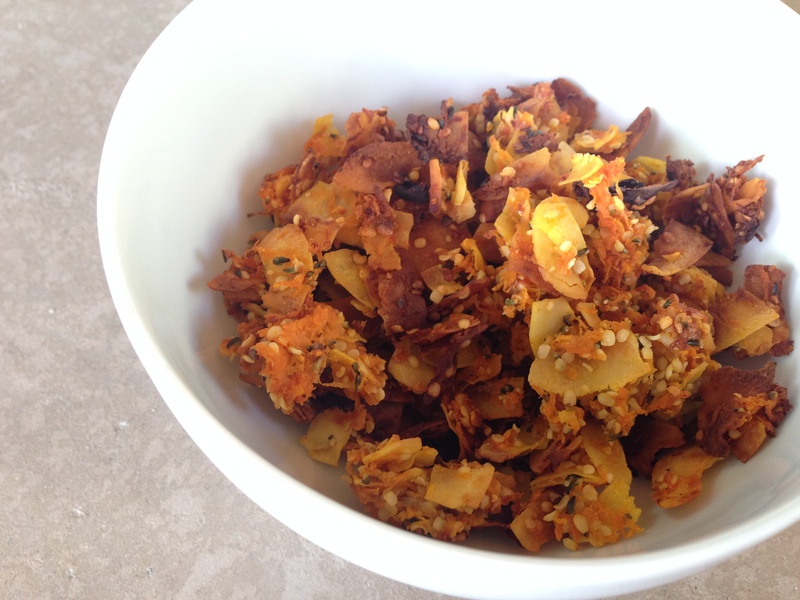 When I originally developed this recipe, i didn’t have a dehydrator but now I do so I will be sure to give your trick for shelf stability a try! Made this today, got a little past golden brown, so some burnt tasting bits, but I think in yogurt it will be ok. I think I’ll add 2 bananas next time so things stick together more. Thanks for the great recipe!